Occasionally, I cry over the news. Generally, war stories or animal rescues are the ones that get me, but when the Supreme Court of the United States legalized gay marriage in June, I absolutely lost it. Tears of joy are the very best kind of tears, and when you're bawling alongside men and women across the country who've just gained rights denied for too long, the salty taste of freedom is sweeter than candy. I immediately threw on my best rainbow attire and began dancing around the house, whereupon I promptly stubbed my toe (note to self, dancing while crying is not necessarily a smart choice), and then ushered in welcome memories of the recent legal win for President Obama's landmark health care legislation, also handed down by the highest court in the land. 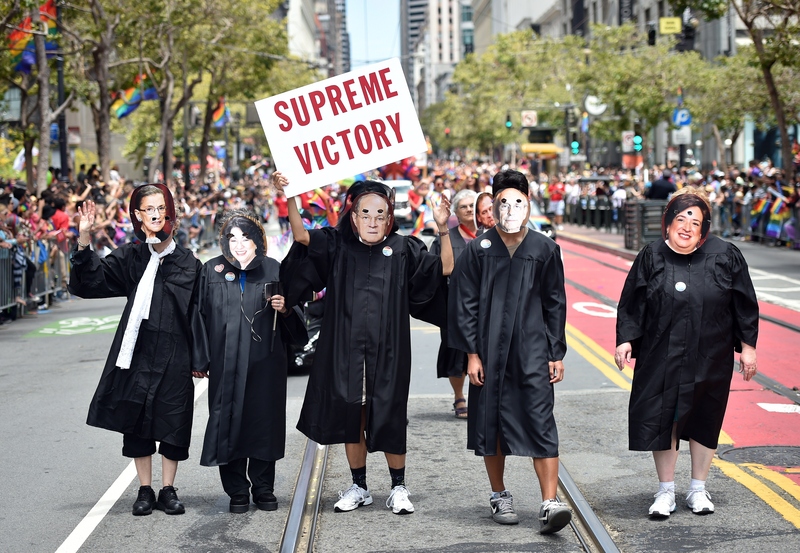 It was at this exact moment — while hopping up and down on one foot, rainbow flag in hand — that I became a Supreme Court fangirl. And, after a few hours online, I discovered I am most definitely not alone. Clarence Thomas' in-court reticence has become somewhat legendary of late, and although we'll never know for sure, it's certainly possible that in his many, many moments of silence, he's simply thinking back to some of the memorable reading he's done over the years. Justice Thomas cited a memoir by Warrick Dunn in a recent ruling, so we know that professional football has his attention. As one of the more unlikely literary pairings to emerge from this research, Antonin Scalia's interest in the work of David Foster Wallace initially struck me as highly improbable. However, after a little digging, I am now prepared to report that having been introduced to the essay "Tense Present" by his son, Scalia became such a fan of Foster Wallace that the two even met for lunch. If that doesn't get you out to your local bookstore in search of a copy of Consider the Lobster, perhaps my own personal opinion that this was the text that truly hooked me on Foster Wallace as a modern master will seal the deal. According to Scott Turow and The Atlantic, Chief Justice Roberts has referred to Charles Dickens’s Bleak House as the greatest legal novel ever written. Whether or not law school is on the horizon for you come fall, when a recommendation of that caliber comes around, you really have no choice but to pick up a copy for yourself. Once you reach the status of Supreme Court Justice, you can pretty much do whatever you want. Nonetheless, it's rare for a sitting justice to recommend reading for the bench, so you can bet that if Anthony Kennedy is suggesting Hamletto the plaintiffs, this is a text of no small value to the man himself. Of course, you never really need an excuse to reread Shakespeare, but if you were hemming and hawing about it, consider the decision handed down. Don't let her apparent frailty fool you — Justice Ruth Bader Ginsburg is a force to be reckoned with on and off the bench, perhaps in part due to her lasting love affair with a unique little exercise manual published by the Royal Canadian Air Force. After a friend and colleague introduced her to the text in 1962, the Canadian Air Force exercises became a regular part of the legal eagle's daily routine, and they remain a part of her regimen to this day. So, if you're looking to shape up in the style of the supremes, you know which text you have to turn to. In her much-lauded memoir My Beloved World , Justice Sonya Sotomayor compares the dysfunction of her childhood in the Bronx to the beloved classic Lord of the Flies. So, if you're looking for a novel that can help you settle into the mindset of a Supreme Court justice, make your first trip to the library a quest for YA dystopia with William Golding. Of all of the justices, Stephen G. Breyer has been the most vocal about his literary choices and the impact of a good book. Even if you're not prepared to take on Proust's À la recherche du temps perdu ( In Search of Lost Time) in the original French, the knowledge that Justice Breyer has read the seven-volume classic in full twice and raved about the experience should be enough to pique your interest. As for me, I'm going for the audiobooks — I have a lot of traveling to do this summer, and perhaps a little Proust will be the perfect way to make the most of a long drive. To make it onto the Supreme Court requires not only an astonishing legal mind and a dedicated career of service to the nation's justice system, but also considerable prowess with the pen. So, you can imagine that if Justice Samuel A. Alito is willing to lend his literary heft to a work of fiction by writing the forward himself, the novel must be of some significance. As the most recent addition to the Supreme Court, it's not entirely surprising to discover that Elena Kagan has somewhat contemporary literary tastes. Nonetheless, to find a Supreme Court justice quoting The Amazing Spider-Man in court documents is certainly enough to elicit genuine shock and awe... and imagining her curled up in a book-lined office with the comic itself is truly the stuff of dreams for a fangirl like myself.